Antwerp: The Otto Ehrhart – Paulding County Historical Society museum in Antwerp houses the collection of more than 500 mounted birds ranging from bald eagles, all kinds of ducks and song birds, to the tiniest humming bird. In addition, you can see a large collection of mounted animals. Many remains of the canal era are still visible. The county was the site of the junction where the Wabash and Erie canal left the Auglaize and headed for Fort Wayne, while the Miami and Erie canal split to the south to Cincinnati. Bowling Green: Bowling Green is the energetic home of Bowling Green State University that interweaves the traditions of the past with the progress of the present. As the county seat of Wood County, the city’s Main Street and downtown area have a plentiful supply of historic buildings and shops. Nearby is the Wood County Historical Center, open April through October, with a variety of special programs and events, along with Snooks Dream Cars Automobile Museum. Bowling Green also hosts the annual National Tractor Pull as well as a great selection of cultural activities in theater, art and music. Take a walk through historic downtown. Our shopping area is highlighted by store-fronts dating back to the 1800’s. Diverse retail businesses sell craft supplies, unique gift items, sporting goods, art, clothing, and much more. Everything is available within a four or five block area. Take your shopping break at one of Bowling Green’s restaurants or deli shops. Defiance: Historic Defiance, at the confluence of the Maumee, Tiffin and Auglaize rivers, has seen every wave of human activity for 12,000 years. It has been the site of villages of many Indian tribes, forts of many wars, a major canal town, and a railroad center. Today, it is a great place to live, attend college and visit.For more information call 1-800-686-4382. Delphos: Settlement of Delphos began in the 1830s and 1840s as workers came to build the Miami and Erie Canal. By 1851 four small communities had developed, and agreed to merge as one town, taking the name Delphos. It thrived as a canal port and as a railroad center in the late 19th century. In 1913 it was included on the original route of the Lincoln Highway–America’s first coast-to-coast roadway. Today’s visitors to Delphos have access to four city parks, the Canal Days festival , and the Buckeye Trail. The Genealogy Center at the Allen County Public Library — Home of the world’s second largest genealogy collection, you can trace your heritage with guidance from experts who have over 500,000 documents available for research. For more information call 260-421-1225. Museums: Fort Wayne has outstanding historical museums, including the History Center, Firefighters Museum, African/African-American Historical Museum, Macedonian Museum, and Cathedral Museum; all offer exhibits and displays that are each unique and interesting. Art museums and galleries include Artlink, the Fort Wayne Museum of Art, Indiana University-Purdue University at Fort Wayne Visual Arts Gallery, the University of St. Francis School of Creative Arts Gallery, and more. 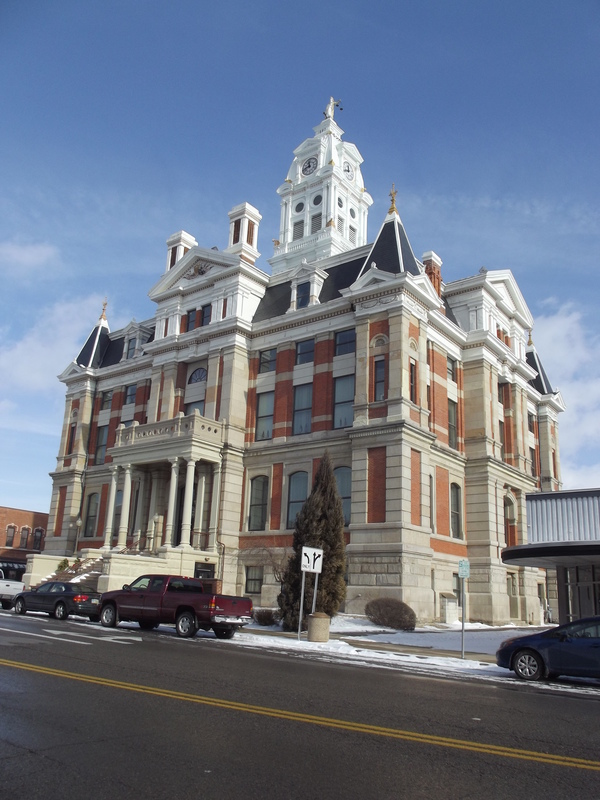 The Allen County Courthouse, a National Historic Landmark, has been recently restored to its turn of the century magnificence. Grand Rapids: The head of the rapids of the Maumee River had been a strategic gathering place for thousands of years. Today, thousands of people still gather for special events like the fall Apple Butter Fest. Grand Rapids has much to offer visitors– bed and breakfast accomodations, restaurants, antique stores, bookstores, and specialty shops. Visitors are able to step back in time and enjoy the natural setting of this beautifully restored canal town. The downtown area contains a perfect blend of the past and the present. Just 20 minutes from Toledo. Lima: Lima is located in Allen County, Ohio, on Interstate-75. Lima’s Allen County Historical Museum complex at 620 West Market Street includes the MacDonell House, a log cabin, the Shay Locomotive, and a railway exhibit. Artspace Lima showcases local art, while Fort Amanda Park provides a great place to canoe on the Auglaize River. The Johnny Appleseed Metropolitan Park District offers a wide array of recreational opportunities. Maumee: After the battle of Fallen Timbers, a town plat was laid out in 1817 and within a few years, Maumee was gaining recognition as an important trans-shipment point between East and West.Come visit some of our excellent historical sites. Maumee is the home of Fort Miamis, the Wolcott House, and the Fallen Timbers Battleground, just to name a few. Napoleon: Founded in 1834, Napoleon is the home to many beautifully restored homes and a vibrant downtown business district. Anchoring the historic business district is the massive Henry County courthouse, which recently underwent a four million dollar renovation, and is located in the National Register of Historic Places.In the mid- and late-1800s, these magnificent court houses rose above the horizon to proudly mark county seats. New Haven: A former canal town, New Haven is a crossroads of America. It is home to the Fort Wayne Railroad Historical Society’s collection of historic railroad equipment. A new canal park provides access to the Maumee and leads to trails and bike paths along the river, and downtown New Haven is the site of the Canal Days festival. Oregon / Northwood: Once part of the Great Black Swamp, Oregon and Northwood providee a variety of recreational opportunities. Originally, the area was a wetland, rich with oak, hickory, ash, walnut, elm and maple trees, tghus leading to the establishment of numerous sawmills and settlements. The City is home to Pearson Metropark, Maumee Bay State Park, South Shore Park and the Coontz Recreational Complex. Festivals include the Oregon Spring Fest, and the German American Festival. Paulding: The John Paulding Historical Society complex, at the southern edge of the village, tells the story of this county’s taming of the Great Black Swamp and its current agricultural heritge. Some of the recreation opportunities include hunting and fishing. Perrysburg: Platted in 1816 by an act of Congress, this historic community has a splendid showcase of buildings and well-preserved stately homes in a variety of architectural styles. Self-walking tour guides are available. The 577 Foundation, with an 1804 log cabin and a 21st century geodesic dome, is fascinating to visit. Sylvania: Sylvania is a community where people choose to locate and raise their families. Sylvania was organized and built on the premise that the foundation of a successful community is its public education system, and first class neighborhood grade schools are the cornerstone of this foundation. Befitting its name, Sylvania has been a “Tree City, USA” for the last 20 years, with beautiful parks nearby our many tree lined streets and neighborhoods. Community recreation, sports leagues, public safety and community continuing education complete the building blocks for a successful community. Toledo is alive with unique and fun attractions for the whole family. Toledo’s world-renowned Museum of Art and Zoo are now complimented by a dozen other major attractions. The Imagination Station is hands-on fun for every age. Cruises on the Sandpiper on the Maumee, exploring the gigantic Lake Freighter James M. Schoonmaker/Willis B. Boyer Museum Ship, or the Fire Fighters Museum. Waterville: Though pioneers were around much earlier, John Pray laid out the village and began drawing a plat map in 1830. Waterville is the second oldest plat in Lucas County. The first canal boat passed through Waterville in 1843 on its way to Fort Wayne, Indiana. Although the village is growing dramatically with a population of over 4800, residents still enjoy the safety of a small community, with easy accessibility to larger cities like Toledo and Fort Wayne. Wauseon: As county seat of Fulton County, Wauseon fulfills the need of every resident and visitor. With 110 retail establishments, residents can still enjoy a peacefully-paced life in a thriving city. Wauseon is a community of diverse industry, strong local businesses, fine schools, well kept homes, extensive parks, and a record of strong, steady growth.